I love a mildly spiced curry and I’m keen on replacing meat with vegetable options, particularly when the sauce in a dish carries all the flavour. 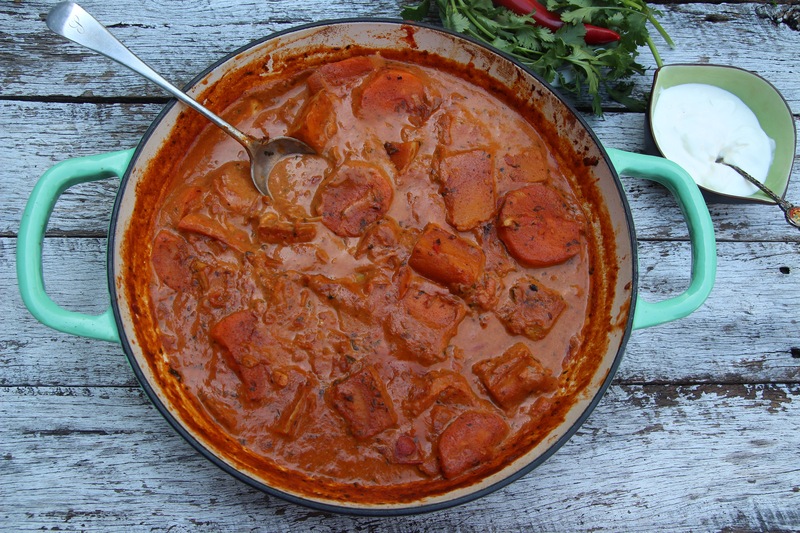 Jamie Oliver’s Chicken Tikka Masala from his lovely book Comfort Food is a great recipe, and easy to make – see my post for his Chicken Tikka Masala. So I have made a version of the dish using butternut pumpkin and sweet potato instead of chicken. 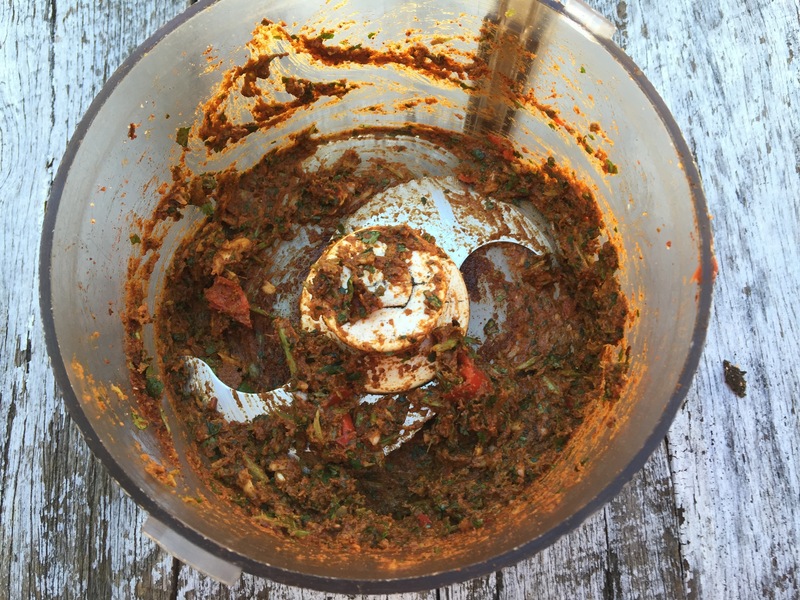 For the curry paste, I used a Jamie recipe from his website on Easy Homemade Curry Pastes. My variation was that I added turmeric to the paste rather than to the curry. I then used the concept of the original chicken recipe, with veggies instead. The recipe that follows is my take on those Jamie originals. My quantities for the actual curry are enough for 4. I used half the curry paste and I have frozen the rest for later. I also made the easiest flatbreads ever, another Jamie recipe of course! First peel the garlic and ginger. Put a frying pan on a medium to high heat and add the spices for toasting to the dry pan. Lightly toast them for a few minutes until golden brown and smelling delicious, then remove the pan from the heat. Add the toasted spices to a pestle and mortar and grind until fine, or put them into a food processor and whiz to a powder. Whiz the toasted spices in a food processor with the rest of the ingredients until you have a smooth paste. Heat the oil in heavy bottomed casserole. Peel the onions and garlic and put into the casserole on a medium to high heat and cook for 5 minutes, or until the onions are golden, stirring regularly. Add half the quantity of the curry paste and fry for 2 minutes. Add the butternut pumpkin and sweet potato chopped into rough chunks and cook for 5 minutes until the vegetables are starting to soften. Pour in the tomatoes, crumble in the stock cube and add 150ml of boiling water. Simmer for 5 minutes, then stir in the coconut milk. Simmer for a final 15-20 minutes, stirring occasionally until the vegetables are soft but still intact. 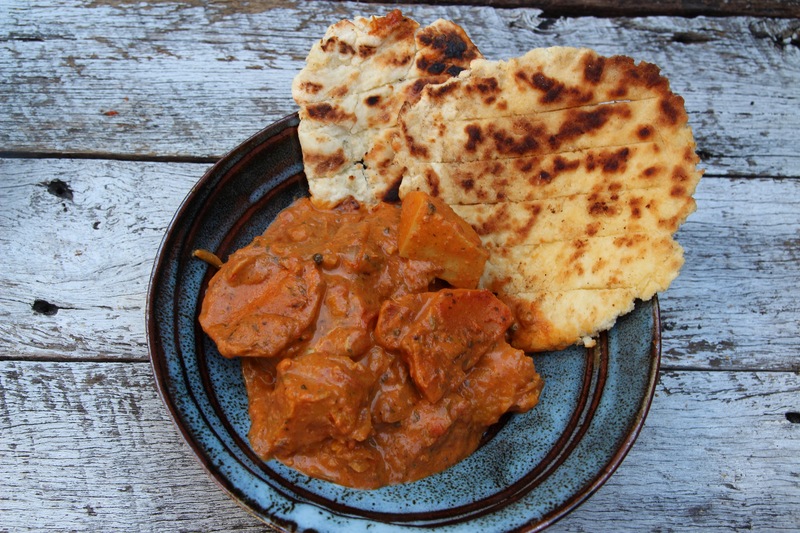 Serve with whatever you usually have with your curry – I made easy flatbreads and had some yoghurt on the side. Add the flatbread ingredients to a mixing bowl and mix together with a spoon, then use clean hands to pat and bring everything together. Dust a clean work surface with flour, then tip out the dough. Knead for a minute or so to bring it all together – don’t need to knead it for long – just enough time to bring everything together. Dust a clean work surface and rolling pin with flour, then divide the dough into 6 equal-sized pieces, roughly the size of a golf ball. With your hands, pat and flatten the dough, then use a rolling pin to roll each piece into 12cm rounds, roughly 2mm to 3mm thick.Use a knife to cut 6 lines into the centre of each round, leaving about 3cm at each end. Place a griddle pan on a high heat, then once hot, cook each one for 1 to 2 minutes on each side, or until bar-marked and puffed up, turning with tongs. I cooked the flatbreads directly on the bars of the barbecue – it worked fine, but you don’t want the heat too high as the flatbreads can scorch. 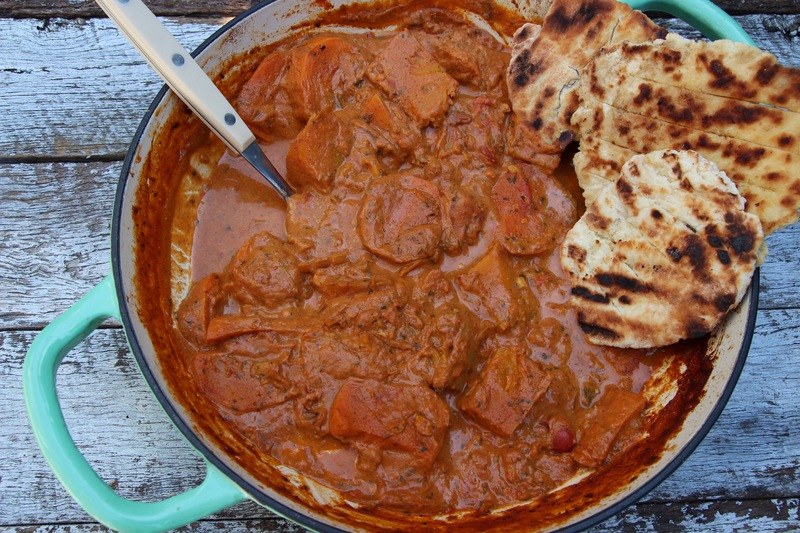 Posted in Jamie Oliver, Savoury Food, Vegetarian and tagged butternut squash, coconut milk, comfort food, curry, flatbreads, Jamie Oliver, tikka masala, tinned tomatoes, yoghurt. Bookmark the permalink. this looks insane i’m going to try and do this in the next few weeks!